MAILING LIST LINK COMING SOON! Welcome to Chillicothe Trade Days! This will be the main information site for Ross County Fairgrounds Chillicothe Trade Days. 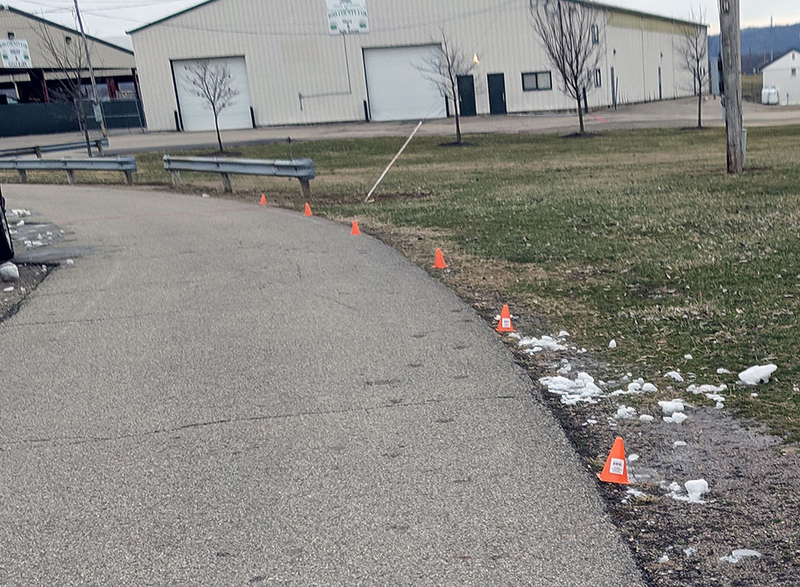 We are currently working with both the fairgrounds and mapping professionals to locate all of the available locations for vendors as well as locations with electric and water for those who may require it. 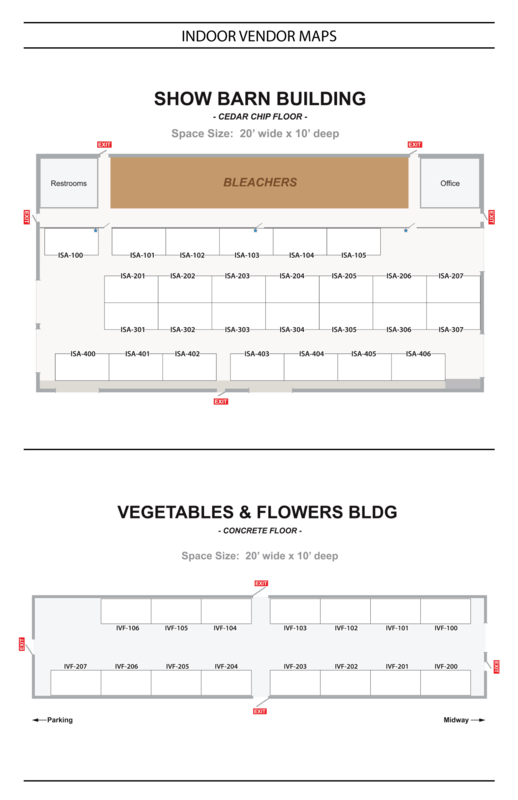 How can I reserve a Vendor Space? At this time we are accepting reservations for the May 11-12, 2019 on a "FIRST COME, FIRST SERVE" basis to select their vendor spaces in the order they were received. 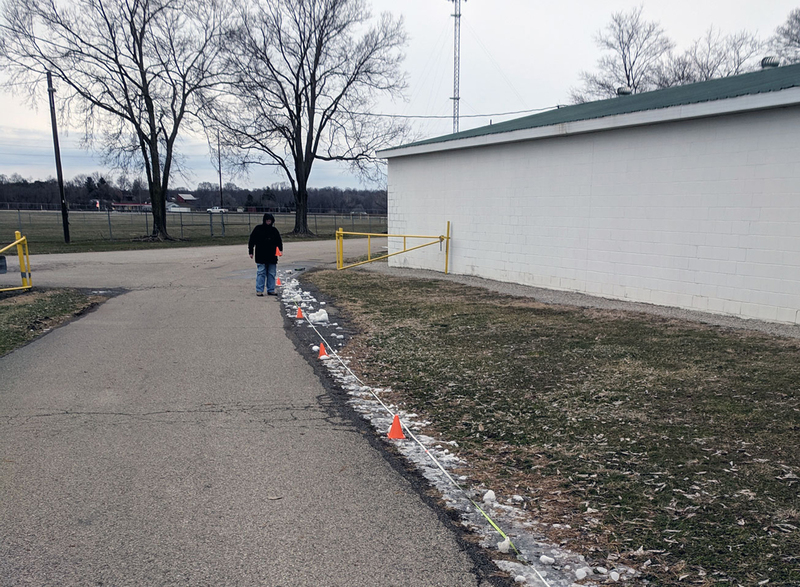 In order to do that we are making the final adjustments on the map to identify available spaces and you will be contacted based on reservation date when we are able to start assigning spaces. Chillicothe Trade Days will be two weeks after our Lucasville Trade Days event this spring, on May 11th & 12th. Open to public each morning at 7 am, close 7 pm on Saturday, and 4 pm on Sunday. Address is 344 Fairgrounds Rd, Chillicothe, Ohio 45601. Vendor Set-up Day and Early Bird shopping on Friday, May 10th. 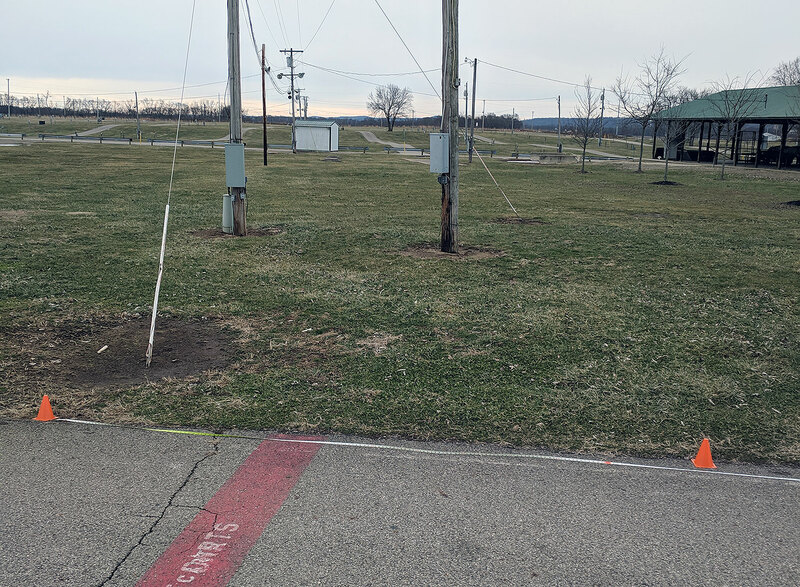 Outdoor vendor spots are $50 in the "Campground Vendor Field," and include water & electric. Outdoor spots in the "Midway Vendor Field" are only $30, but electric is $5 extra for the weekend. 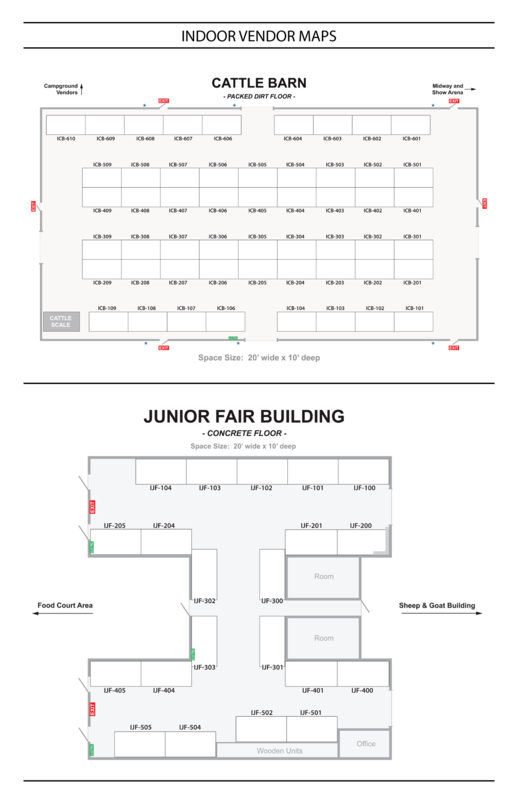 Indoor vendor spaces are 10' deep X 20' wide, and $40 for the weekend. 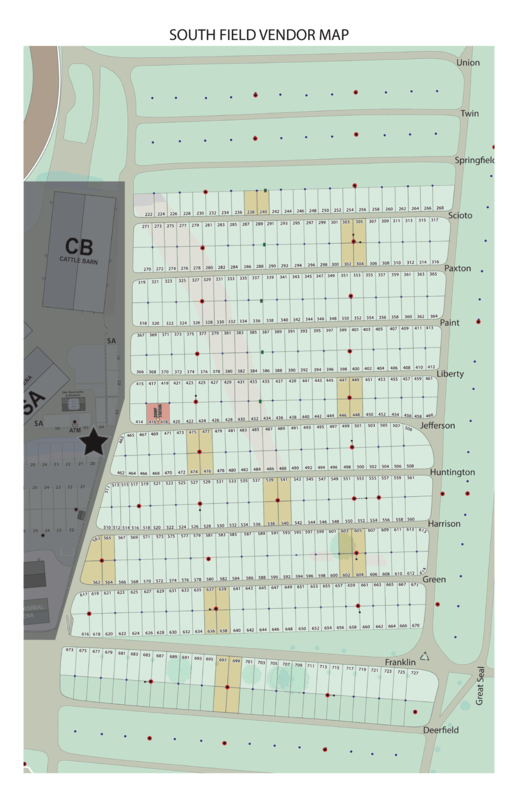 As the Vendor Availability Maps show, we've sold a lot of them already. General Admission will be $5 for the day and children 12 and under are FREE! 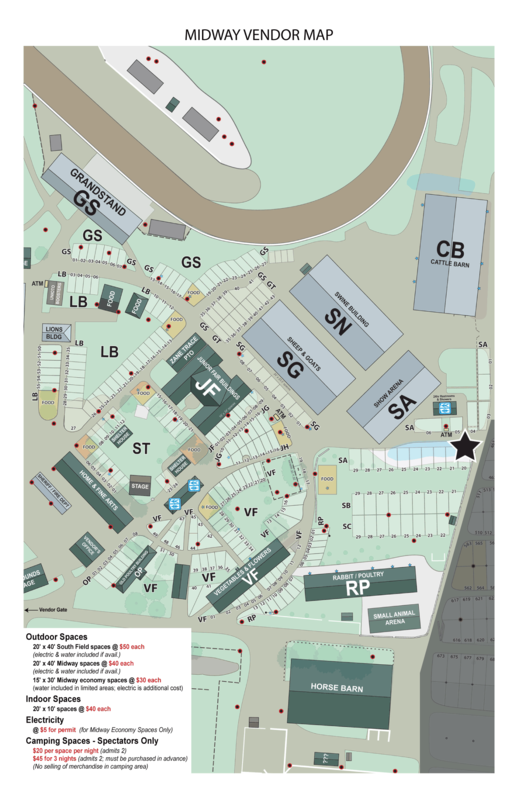 We will update our map at least once a week with the remaining available spaces for vendors at our event. Food Vendors need to call (937) 733-6002 or email foodvendor@ohioswapmeet.com for availability and pricing. We have finished our mapping, space locations and pricing for the May 11th-12th event. CLICK ON THE IMAGES BELOW TO VIEW A LARGER VERSION OF THESE MAPS. 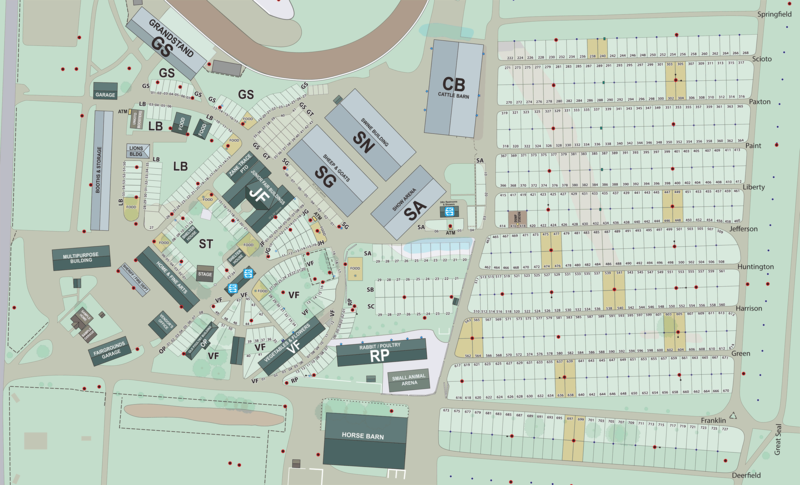 If you want a printable and scalable map click the button under the map for a PDF file you can view, download and print. 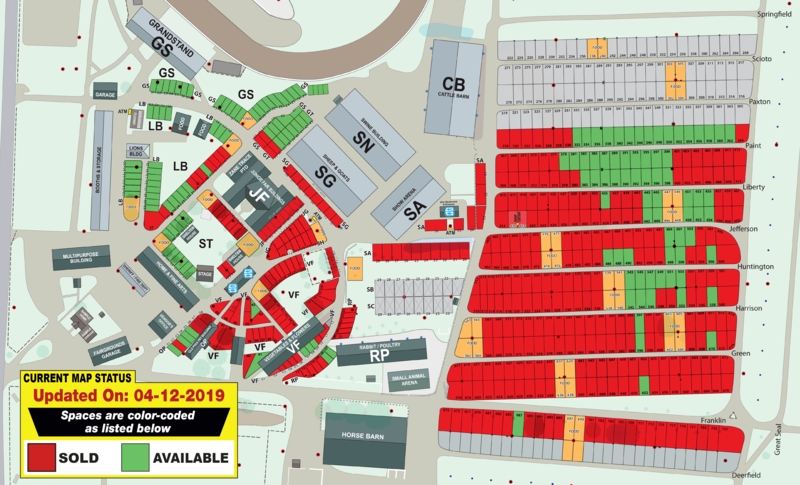 We also have a single map with the entire fairgrounds showing current vendor spaces we plan on using for the Spring event. Click the map images below to open a larger version or if you want a printable and scalable map click the button under the map for a high-resolution PDF file you can view, download and print. 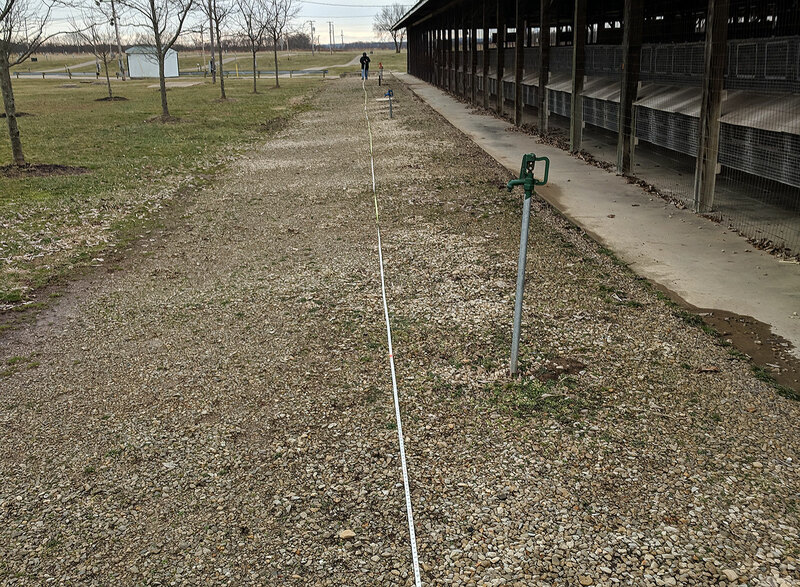 While the snow and winter weather caused delays we have been working on the mapping of the fairgrounds. 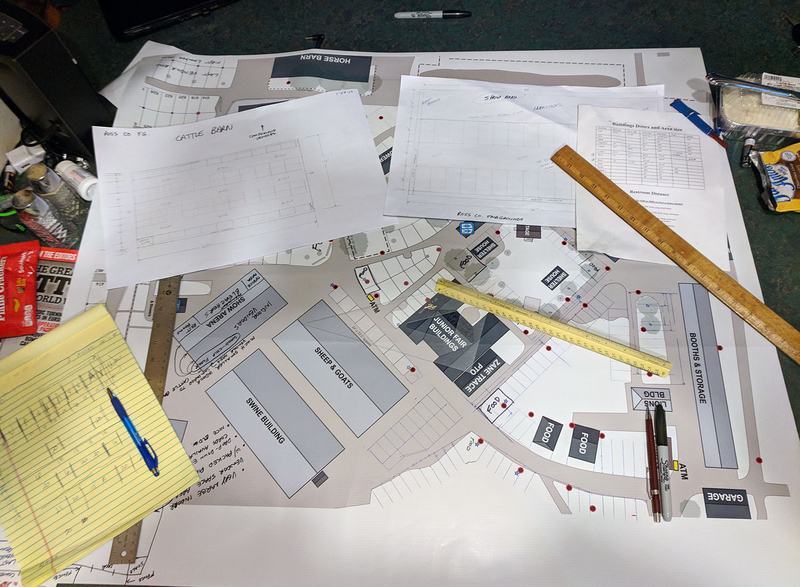 We have been identifying obstacles and creating an improved spectator crowd flow that benefits both vendors and their customers as they enter the fairgrounds. 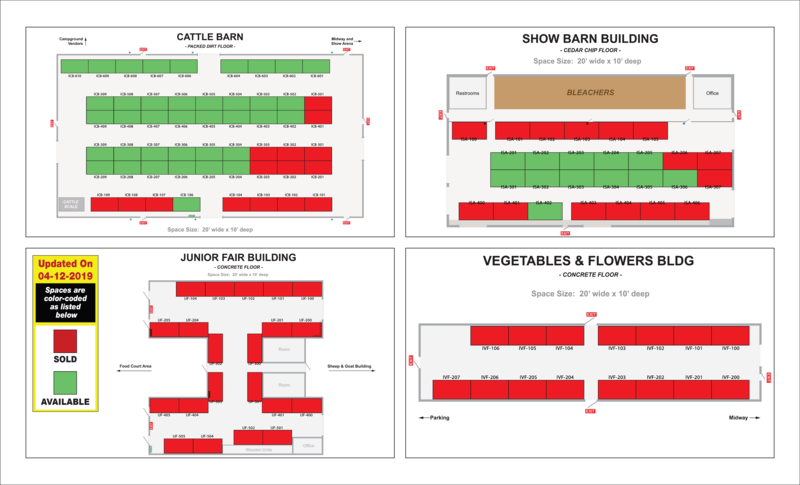 Past events have had vendors spaced too far apart and due to the vast area of the fairgrounds they can be overlooked. 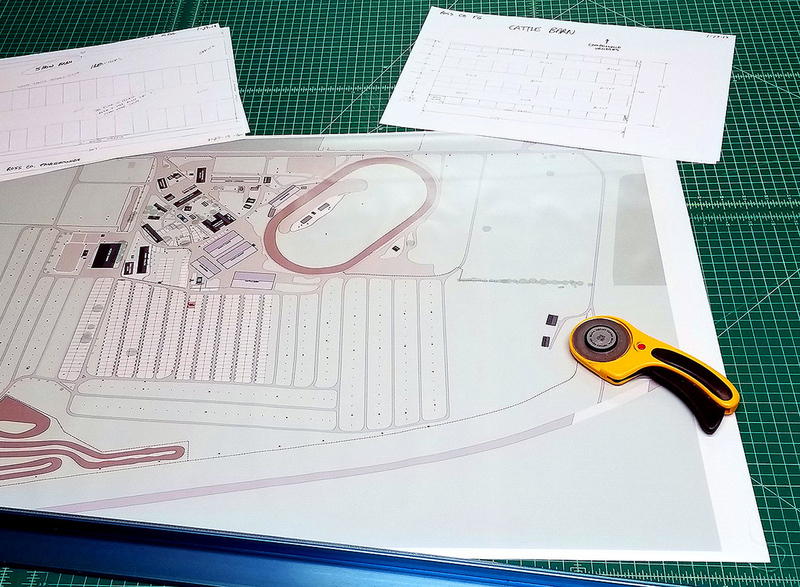 At this time, when weather permits, we are finishing the layout map and will post it online once completed. Here's some images of what we have been working on and continue each day.